The Main attraction is here! 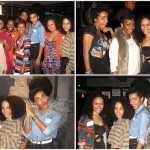 I am looking forward to seeing all of you this evening for the “Mane Attraction, His Voice // Her Voice” event. 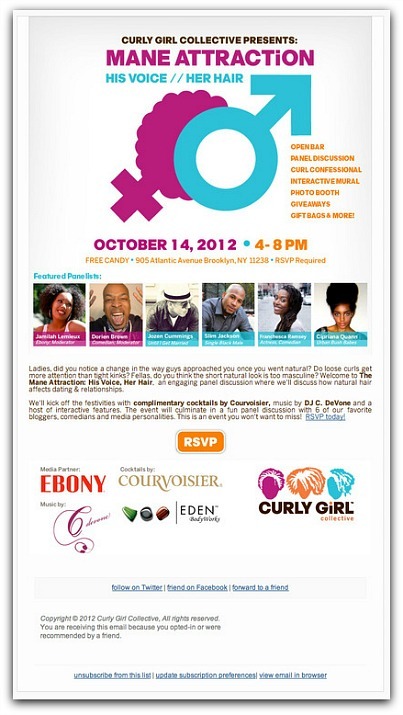 Presented by the amazing ladies of the Curly Girl Collective and held at the Free Candy Space in Brooklyn, NY from 4-8PM. 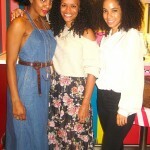 For those who have never attended an event by the Curl Girl Collective, then you are in for a fun filled night! Not only will I be in attendance with Franchesca Rasmey of Chescalocs, but we will also be part of the panel this evening, engaging in some very, very interesting conversation, a discussion that will share more than just the female perspective but the perspective of the male as well. In addition the lovely Fran of Hey Fran Hey will be in attendance..
See you soon and make sure you eat a very hefty meal since one of the treats tonight besides giveaways and gift bags is open bar presented by Courvoisier!!! *Unfortunately RSVP is at capacity and if this is the case, I will definitely have a behind the scenes update for you!